WILMINGTON, Del. 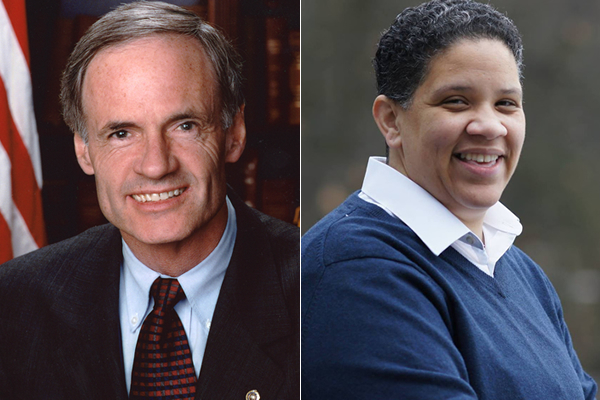 —The first and only primary debate in the Delaware U.S. Senate race between incumbent Sen. Tom Carper and challenger Kerri Evelyn Harris was held Monday. The two are running for the Democratic Party nomination for the election on Nov. 6. The primary election to decide the nominee will take place on Sept. 6. Carper was first elected to the U.S. Senate in 2000 and is seeking re-election to a fourth term. Carper’s list of endorsements includes Vice President Joe Biden, Planned Parenthood Action Fund and the Moderate Democrats PAC. Harris is looking to make history by becoming the first openly LGBTQ woman of color to serve in the U.S. Senate. She has been endorsed by Justice Democrats and Alexandria Ocasio-Cortez, who recently won the Democratic primary in New York’s 14th congressional district, defeating incumbent Joe Crowley. A panel consisting of a reporter from the Delaware News Journal, the editor-in-chief of the University of Delaware’s student run newspaper, The Review, and a Wilmington-based journalist asked Carper and Harris a series of questions submitted by readers of the News Journal. The questions covered health care, college tuition/student debt, political gridlock over immigration reform, women’s reproductive rights, the environment and the policies made by President Trump that the candidates disagree with. Carper has been running his campaign on his record on the environment, healthcare, his support for renewable energy development and his work on passing the Affordable Care Act. Harris argues that while she does appreciate what Carper has accomplished so far regarding healthcare, it’s not enough. Additionally, she criticized Carper’s support for the Keystone XL Pipeline and the lack of provisions to community banks because of Senate Bill 2155 — which Carper co-sponsored — from the Dodd-Frank Act that Carper co-authored. The candidates clashed on women’s reproductive rights, with Harris saying that, as a woman, she did not agree with Carper’s belief that the law has been settled because it can be overturned and that there are not enough women elected to office fighting for these rights. Both candidates agreed that Democrats reclaiming majorities in the House and Senate and replacement of the president would be necessary regarding immigration reform. Carper called for the support of Alliance of Prosperity, which he says addresses the causes of illegal immigration. Harris called for disbanding ICE. Throughout the debate, Carper emphasized his experience in office. He says it’s one thing to know what the right thing is to do, but it is another thing to do it. Carper stated he has fixed things and not just talked about fixing them. Carper voted in favor of Kavanaugh to be a U.S. Circuit judge in 2006. Carper has gone on record saying that Kavanaugh’s 12 years on the bench have resulted in a record that’s a “profound disappointment.” Carper stated during the debate he would not vote for him again for Supreme Court justice, and he would work to make sure he is defeated. Harris replied to Carper’s answer saying his vote for Kavanaugh is still problematic, as it resulted in those who support Kavanaugh using the argument that he is a moderate. According to the LGBTQ series that was held by the Rehoboth Beach Museum last month, there were concerns raised by the LGBTQ community in Delaware of the tone being set by the president and the future of the Supreme Court. Carper mentioned he has been endorsed by the Human Rights Campaign, but it has not been officially announced yet. He expressed that part of his drive in supporting LGBTQ rights comes from treating other people the way he always wanted to be treated. He reiterated the concerns raised have been addressed and said the country is now better for it. Harris said that despite the LGBTQ community being more accepted in Delaware, there are still bigots everywhere.